This homeowner in East Peoria was fed up with water leaking through their ground level windows. They had tried other solutions, but the material was weak and unreliable. The owners decided they needed an efficient and durable solution that was also aesthetically pleasing. They called up the team at MidAmerica Basement Systems and set up an appointment for Mark Kurtz, a MidAmerica Basement Systems expert, to come out and inspect their home. The homeowners were excited about the project and with Robert Stoutenberg leading the team, they installed the SunHouse waterproofing system in place of the unsightly window covering from before. Now the home owners have leak free window dressings that are sturdy AND that allow an abundance of natural light into their basement. My basement leaks. I currently have 2 sump pumps. Solid foundation, from what I can tell. just getting tired of the mishaps. "Just want to say Thank You to the guys in the crew . They..."
I am very satisfied with the job, and I will tell my friends and anyone who needs basement work done. Kenny's crew did a wonderful job. I was very happy with the work that they did. A co-worker recommended you and I also thought you were a good price. I am happy with the work that MidAmerica Basement Systems did. We will properly install a hidden drainage system in your Mark basement and completely encapsulate your crawl space with CleanSpace vapor barrier. We are here to solve the problem for you. Unlike the average Mark contractor we use completely inorganic, waterproof materials. Even if the basement floods your walls and floors will not be damaged by the water. These waterproof products are patented and are built to create an attractive finished basement that lasts a lifetime. Foundation problems such as bowing foundation walls destroy your Mark home’s value and can be dangerous. Our in-house team of structural and geo-technical engineers are here to help. We design and install the right solution and usually have the project finished in less than a week. You will have peace of mind as we provide a 25-year written warranty against defects on our foundation products. The sunken, cracked concrete around your Mark home is both an eyesore and a safety hazard. It is also likely to get worse, but we can fix it for you. If you think you might have radon gas seeping into your home, it's time to take action. 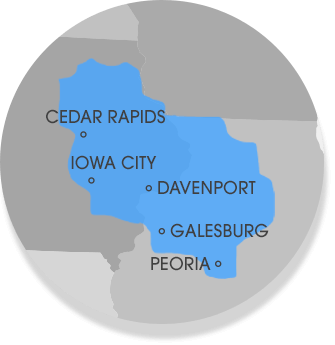 We help homeowners in Mark, IL with radon testing, and can even provide a FREE quote for the cost of a radon mitigation system for your home. With patented systems in -place, Mark and Donna have a dry, bright and safe basement! Before the project can begin, the team takes care to mark areas in which it is safe for installation. Homeowner, Mark was in the market for a basement waterproofing system. He wanted his basement waterproofed, but also to still be able to use the space for storage and entertainment. He reached out to the experts in this area, MidAmerica Basement Systems. Design Specialist, Wes was able to come out to Mark's home to give him the best recommendation for his basement. Wes recommended to waterproof the basement that the best solution would be WaterGuard and a TrenchDrain. Since Mark wanted the space to sill appear finished, Wes also recommended Everlast Basement Wall System. The Everlast Basement Wall System is perfect if you do want to rip up your entire basement walls. It is a washable wall surface, that does not need to be painted, and cannot be ruined by plumbing leaks or high humidity. The trim is all plastic and installed with metal studs. The panels of the system are made with a vinyl finish and covered with a textured mold proof. A WaterGuard System pairs perfect with the Everlast Basement Wall System. WaterGuard can be installed behind the Everlast Basement Wall System, allowing water to be drained unseen, and away from the basement. Mark B. is the homeowner of this basement in Aledo was concerned about water coming into his basement whenever it would rain. Mark was especially worried because the basement was somewhat finished so he wasn't sure what area to expose to find the source of the seepage so he called the experts at MidAmerica Basement Systems. The team installed the SuperSump system which is a patented system that can be fitted with the cast iron zoeller pump the space would need. The SuperSump comes with an airtight lid and airtight drain which allow water to drain but does not allow water vapor to rise back into the space. The lid also prevents debris from falling into the sump jeopardizing the function of the sump. WaterWatch also comes with the SuperSump to alert Mark of issues that may arise. The team constructed a discharge line and connected it to the LawnScape to expel water out of the space. The team also installed the IceGuard which will repel water away from the foundation walls in the case of a pipe freezing. Now Mark has fewer worries when he sees a cloud in the sky! Vicki and Kermit, are the homeowners of this Geneseo basement. They wanted to secure the space from water damage and soon called on the team at MidAmerica Basement Systems. MidAmerica worked with the homeowners schedule and set an appointment for a free inspection. The expert, Mark Kurtz, came out and assessed the space, then quoted the homeowners the same day at no cost to them. Soon the MidAmerica team was hard at work providing these homeowners with a dry, waterproofed basement. The team installed the SuperSump pumping system that is powerful, efficient and comes with an alarm system that alerts the homeowners of any issues. The homeowners also wanted a back-up system in case the power goes out, so MidAmerica installed the UltraSump, which is a dual battery switching unit that can pump upwards of 12,000 gallon in the event of a flood or major leak. Lead by Justin Bailey, the team further waterproofed the space by equipping the WaterGuard waterproofing system, which leads leaks directly to SuperSump pump system. This basement owner has a basement prepared for rainy days and other unexpected leaks! MidAmerica appreciates Vicki and Kermit’s business and is happy to have been of service! Richard was dealing with a little bit of everything in his basement from water, bowing walls, but his main concern was the radon levels. He remembered seeing MidAmerica Basement Systems at the Peoria Home Show and decided to give them a call for a free estimate. Shortly after calling them, an appointment was set up for Mark Kurtz to come out and diagnose the issues in the basement. Mark decided the best solution for Richard’s high radon levels was to install a new radon mitigation system. The radon mitigation system will calculate the radon levels in the home and take the radon out and away from the home. Richard is extremely happy with the work and professionalism of MidAmerica Basement Systems. He no longer has to worry about the radon levels in his home. Michael and Shirley were having a water problem on one side of their home and wanted to see if it could be fixed. They also wanted to replace their existing windows with some type of window well. They were referred to MidAmerica Basement Systems to get a free estimate on their basement. After a short phone call, an appointment was set up with Mark Kurtz to come evaluate the basement. Mark decided the best solution for their specific problem was to install a SuperSump pumping system and WaterGuard around the wall with the water issue. The SuperSump pumping system will pump any water up and away from the home. The WaterGuard will direct the water to the SuperSump to be pumped out. Mark also showed them the SunHouse window well, which will allow more sunlight in the basement but also keep the water out. They loved the idea of the SunHouse. Michael and Shirley are very happy with the work done by MidAmerica Basement Systems. They now have a bright and dry living space downstairs. Payne and Teresa were having structural issues in their home, which they were trying to sell. They saw MidAmerica Basement Systems at the Peoria Home Show and decided to give them a call. After a quick phone call, an appointment was set up for Mark Kurtz to come and diagnose the issues. Mark decided the best solution for the basement was to have Power Braces and CleanSpace installed. The Power Braces are mounted up against the wall to prevent it from caving in and also push the wall back over time to get back to its upright position. The CleanSpace walling system is put against the wall to give it a cleaner, less “basementy” fell. Payne and Teresa are very happy to have the foundation of their home repaired. They can now sell their house with an increased value because of the work MidAmerica Basement Systems did. Mark and Donna were tired of dealing with an older dreary basement that also had a water problem. They have used MidAmerica Basement Systems before and decided to go to someone they trusted. Soon after giving them a call, an appointment was set up for Mark Kurtz to come out and diagnose the basement. Mark decided the best solution for their particular basement was to have 2 SuperSump pumping systems, a full perimeter of the WaterGuard drainage system, along with new basement windows, and an egress window. Having the 2 SuperSump pumping systems is necessary for their larger basement space to make sure all the water is pumped out and away from the home. The full perimeter of WaterGuard will keep the water out of the entire basement in the case of future water troubles. The new basement windows also help keep the water out and the egress window adds an extra escape route for a legal living space. Mark and Donna could not be happier with again choosing MidAmerica Basement Systems as their waterproofing specialist. They no longer have to worry about water in the basement and can now create a living space if they so choose. Adam and Diana had very noticeable cracks in their basements foundation walls and wanted to get help before it was too late. They found MidAmerica Basement Systems in the local Yellow Pages. Shortly after calling the office, an appointment was set up for Mark Kurtz to come give a free estimate on their basement. Mark decided the best solution for the cracked and bowing walls was to have Power Braces put up along the foundation. The Power Brace system will stop the wall from caving in any further and also progressively move the wall back to its original position. Vicky has lived in her house for several years and continued to have a water problem in her basement. She finally had enough and went online in search of professional help. She found MidAmerica Basement Systems right away and wanted to learn more. She was very pleased to find out the estimate was free and the appointment was set up right away. Mark Kurtz, a trained design specialist, was sent to Vicky’s house and after a thorough inspection he came up with a customized solution for her specific problem. He proposed a WaterGuard drainage channel that would unnoticably direct the water to the TripleSafe pumping system that was also going to be installed. The humidity was a little high in her home as well, so Mark proposed a SaniDry dehumidifier to keep mold from growing in the basement. After Mark went over how the whole process worked with Vicky, she was sold and got the appointment scheduled. Vicky’s basement was completed by MidAmerica Basement Systems in the middle of 2012 and it continues to stay completely dry to this day. She could not be happier with her decision in choosing MidAmerica Basement Systems and now has no worries about water when it rains. There was water in Tina and Jeremy H.’s basement every time it rained. Looking for a solution on the internet, they found MidAmerica Basement Systems and decided to give them a call to fix their water problem. After a short amount of time on the phone, an appointment was set up to have a trained design specialist, Mark Kurtz, come out and diagnose the issue. Mark decided the best solution was to install a WaterGuard drainage channel that would direct the water to the SuperSump pumping system that was also being installed. The SuperSump pumping system takes the water from the WaterGuard and pumps it out of the house through a discharge line, which will take it a safe distance away from the home. Tina and Jeremy H. had their basement waterproofing done at the beginning of 2015 and through all the storms, have not had any water problems. They are very happy with the decision to choose MidAmerica Basement Systems to waterproof their basement, they are now worry free when it rains. Sue B. purchased an older home and noticed water coming in the basement. She wanted an interior solution rather than having her yard torn apart. She did some research on the internet and found MidAmerica Basement Systems was the best fit for her. The call center listened to Sue’s problem and sent out Mark Kurtz, a trained design specialist, to further inspect the issue. Mark proposed a custom solution to fix the issue which included a TripleSafe pumping system and a full perimeter of WaterGuard. The full perimeter of WaterGuard will filter the water to the TripleSafe pumping system, where it will be pumped out of the home a safe distance away. Sue B. was extremely happy she was able to fix her water problem without having to dig up the outside of her home. Her basement is now dry and will be for many years, she now has no worries about the basement being wet after it rains.